Baked Jalapeno Poppers - Easy to Make and Game Day Ready! 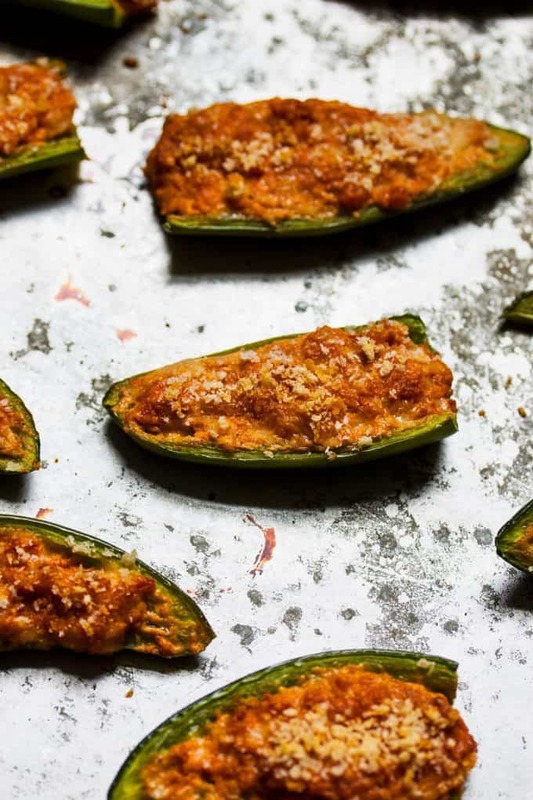 These baked jalapeno poppers are stuffed with chorizo and chihuahua cheese. Spicy, cheesy and delicious! Perfect for any occasion or party. Jalapeno poppers have been one of my favorite snack foods and appetizers for a long time. Spicy food is always delicious in my book. Deep fried foods, however, aren’t at the top of my list however. I am not on a special diet but I do try to eat more healthy. And I’m kind of addicted to appetizers so if I can shave off a few calories here and there I’m all for it. Especially since I’m likely to eat more than a few servings. Yeah, I know. So bad. 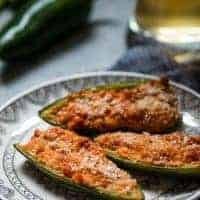 I originally ate a version of these stuffed jalapenos at a friend’s bar and the addition of chorizo to theirs really called to me. I then set out to create my own similar version. 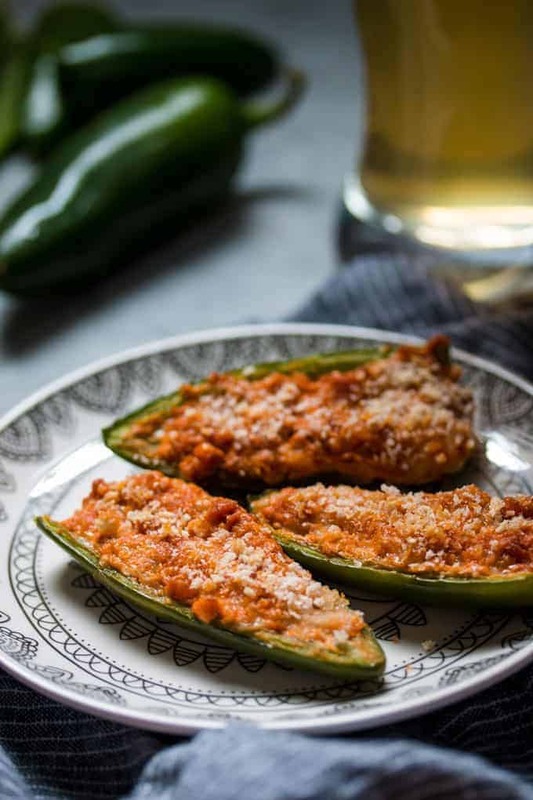 Creating easy appetizer recipes has always been my goal and these baked jalapenos stuffed with chorizo and chihuahua cheese really fit the bill. And I have to admit something… I ate 5 jalapenos in one sitting because of this recipe. I made it twice in one week. I gorged each time. Its delicious. As I’m typing this, I have heartburn from eating too many of these babies. And I would do it again (and probably will). Because they’re baked and not fried, its slightly healthier than a traditional popper. The chorizo and chihuahua cheese hurt you a little if you’re counting calories but since I’m not (and I’m really only worried about deep-fried food) they work for me. What makes these jalapeno poppers so great? These jalapeño poppers are baked and not fried. They have a little crunch too! Chihuahua cheese balances out the spiciness of the jalapeños and the chorizo adds umami. You get a little bit of everything with this recipe. Bite-sized appetizers are perfect for parties! 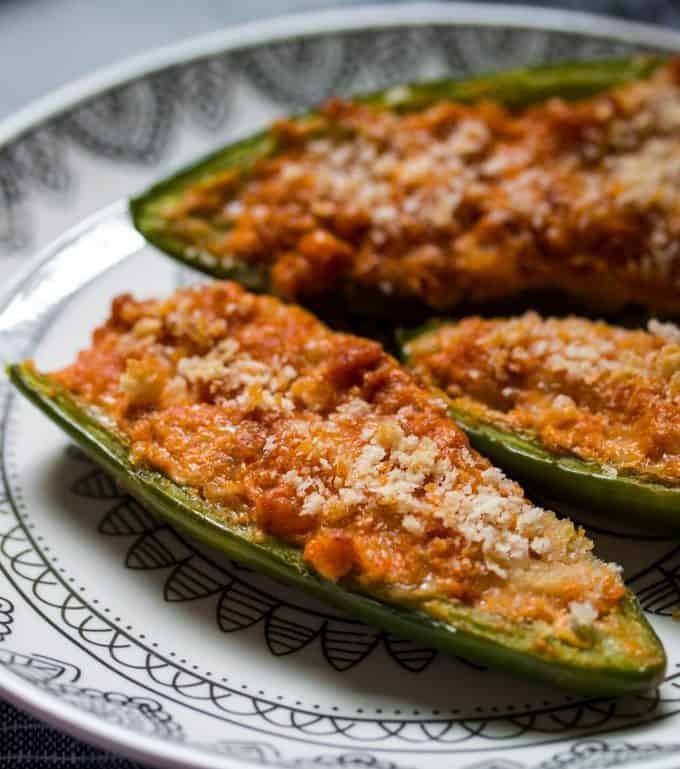 These stuffed peppers would be a perfect appetizer next to layered taco dip, tomato queso dip, or slow cooker sweet and spicy meatballs. Think about game day! 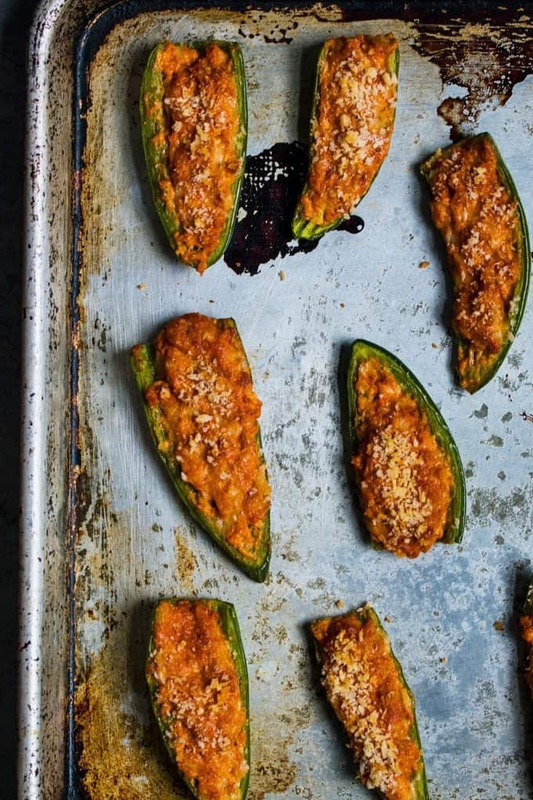 These baked jalapeno poppers ares stuffed with chorizo and chihuahua cheese. Spicy, cheesy and delicious! Perfect for any occasion or party. Pre-heat oven to 400 degrees. Line two cookie sheets with foil. In a stand mixer, mix the cream cheese, chorizo, chihuahua cheese, and cumin until well combined. Using a spoon, fill the jalapeno halves with the cream cheese mixture and place on the foil. Evenly space the peppers over the two cookie sheets. 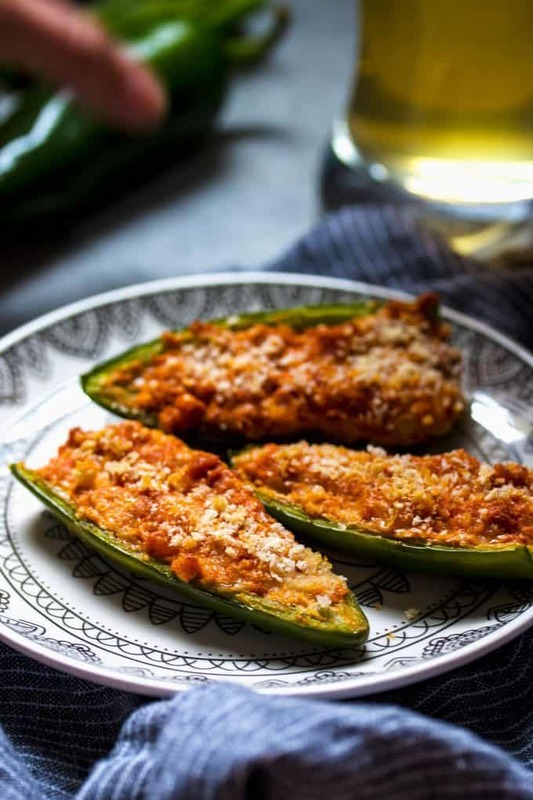 Sprinkle the top of each filled jalapeno with panko bread crumbs. Place the cookie sheets in the oven for 18-20 minutes – the cheese should be melty, the panko crispy and the jalapenos soft. Wait 5 minutes before serving. Looking for other game day appetizers? Try these buffalo cauliflower bites, this pepperoni pizza dip, or this chicken fajita queso dip. Will be trying these! Thanks. Wow. My husband would love these. Thank you for sharing with us. My hubby would love these. Thanks for sharing your recipes! I’m going to try these for him very soon!